Americarpet: Rubber flooring: your best friend for your many flooring needs. Rubber flooring: your best friend for your many flooring needs. It’s easy to see why rubber is the flooring of choice for many commercial, educational and government establishments – and even, in some cases, a good choice of flooring for areas of the home. It has outstanding durability, as well as resilience and is also resistant to burns, scratches, dents and stains, as well as being completely waterproof. Furthermore, it comes in a stunning array of colors and designs and can also incorporate textures for additional luster. Surprisingly, it can also be a very environmentally-friendly option! Traditionally, rubber came from the milky sap of the rubber tree and natural rubber is still harvested in this way. However, the majority of rubber flooring is now often made of synthetic materials. Rubber has always been popular in industrial settings because it is one of the most hard-wearing and resilient floor coverings available and yet still offers a remarkable level of cushioning underfoot and impact absorbency. Its water-resistant and stain-resistant surface, as well as its chemical stability, means that it is ideal in high moisture areas and where thorough cleaning (with water and harsh cleaners) is regularly required. This also makes them ideal for bathrooms in domestic settings. 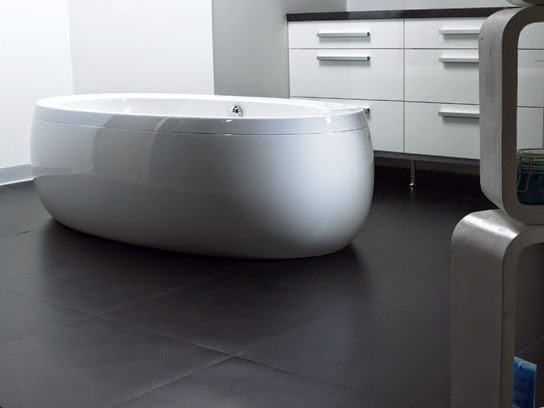 (Note: in heavily wet areas, rubber flooring must be combined with a wet room system to provide a reliable moisture barrier and prevent water leakage). Rubber flooring is used in a huge variety of settings, from airports to schools, hospitals to clinics, farms to restaurants, as its high durability and resistance to wear and tear means it can cope with just about anything, from dogs claws to stiletto heels! In many of these cases, particularly in areas of high traffic, it is worthwhile applying a maintenance layer of polish to the surface to make cleaning and maintenance of the rubber flooring easier! Rubber flooring is used in commercial and industrial settings for heavy traffic areas due to its combination of aesthetics, functionality and value. It is also widely used in public transport as it meets the stringent requirements of public safety and durability – not only does it have slip resistance and abrasion resistance but it also performs highly against fire and smoke emissions. Lastly, rubber floors are embraced in the sports and fitness industries where their flexibility and cushioning, together with their resiliency and hygiene-promoting properties make them the ideal flooring material. Rubber floors have also gained in popularity with modern designers as it gives a room a unique ‘high-tech’ look and feel, as well as being versatile enough to match a variety of design schemes. Modern rubber flooring comes in solid sheet or tile form and is available in wet suit finishes, primary and pastel colors and with embedded textures, such as studs or ribbing, for potentially wet areas to prevent slipping and accidents. Stable: Rubber has in-built UV-stability which makes it ideal for outdoor use, weathering very well in semi-UV exposed areas. For strongly exposed areas, the rubber can be treated with a special sealer coating which will prevent fading and make it more resistant to strong sun exposure. Rubber also has good dimensional stability, which means it shows no noticeable shrinkage or expansion in fluctuating temperatures. Durable: Most good quality rubber is guaranteed to last the life of the application without cracking, wearing or breaking. In fact, it is not unknown for the rubber floor to outlast the life of the premises in places such as airports, stations and public transport such as buses and trains. Their longevity is due to their high abrasion resistance and also to an in-built system of self-releasing wax which helps the rubber “heal” against scratches and abrasions. The other factor that helps their longevity is rubbers inherent resilience and flexibility. Anti-Fatigue: One of the key benefits of rubber flooring is its cushioning effect which dissipates impact energy and thus reduces strain on joints and muscles. This then helps to provide comfort underfoot and prevent fatigue. This makes it an ideal flooring for situations where people will be standing for long periods, from the domestic kitchen to commercial settings such as factory conveyor belts, bars, shopping centers, cash registers and transit areas. This cushioning comes from rubber’s highly-elastic polymer chains arranged in a unique cross-linked network, which enables them to act like miniature springs beneath your feet and gives rubber some of its great resilience under heavy weights. Hygienic and Safe: Rubber’s smooth surface means that it does not easily harbour pet hairs, dust mites and other allergens. The elastomers within rubber also give extremely high surface traction, making rubber flooring an ideal anti-slip floor covering in both work and home environments. Furthermore, good quality rubber is formulated so that it does not produce any toxic substances when incinerated, thus giving safety in the event of fire – particularly important for public places. Low Static: Rubber flooring can be available in a static-dissipative version which is of key importance in certain settings such as hospitals, computer rooms and electronic manufacturing plants, where control of build-up and static discharge is vital. Oil-Resistant & Water-Resistant: Rubber flooring can also often be formulated to withstand oil, grease and chemicals which makes them ideal for settings where these compounds are present in high amounts – e.g. car dealerships, beauty salons, food processing facilities and laboratories. Long-Term Economy: Because of its longevity and durability, leading to a long life cycle – together with its low maintenance – rubber is without question one of the most economical flooring types in the long term. Insulating: Rubber is a fantastic insulator, both of temperature and sound. The molecular density of the elastomers in rubber helps it absorb sound and impact, and reduce the transfer of noise, resulting in a quieter environment. Its thermal insulation properties also provide comfort in winter and even in summer, keeping the environment warm and cool respectively. Rubber flooring may not be your first thought as environmentally-friendly flooring but it actually has a lot of eco-friendly properties. Because of its long life cycle, there is no need for frequent removal and disposal of flooring materials plus regular installation, thus reducing use of chemicals (e.g. adhesives), wastage and demand on natural resources. Once it is finally removed, rubber can be recycled. Even if it is not, it is easily disposed of in landfills and in many cases, if it has been formulated without PVC’s, there will be no toxic plasticizers, halogens, or dioxins to seep into the groundwater. Lastly, rubber has been shown to significantly improve indoor air quality.